“Death, Unchartered” by Dorothy Van Soest is a haunting read that will cause readers to sit up and take notice. It is a powerful journey wrapped up in an intense mystery/thriller one won’t soon forget. When former school teacher Sylvia Jensen learns that the skeleton of a young boy has been discovered hidden at a school in the Bronx, she is distraught. Not only is she sure she knows who the boy is, but she is also convinced she knows who murdered him. The only way to know for sure is for her to team up with her friend JB Harrell, who is an investigative reporter. Because there was a lot going on at the time that Sylvia was involved with this school, many painful memories come to the surface. She was a young, married teacher who tried to fight a system that allowed another teacher to physically abuse students. Her passion for teaching also caused her to decide to keep teaching during a strike. Not only did this cause her to lose friends but it also endangered herself and people close to her. The events that took place during the late 60s caused Sylvia to end up in a dark place that took her a long time to escape. Now she must go back and confront those painful memories. “Death, Unchartered,” covers a lot of hot topics from both the past and the present. Racial inequalities, poverty, political corruption, greed, and gang violence were particularly of concern to the protagonist in the past and much of it carried over to the present. The protagonist and several other related characters must step back into painful times in order to find answers. In doing so, they put their lives at risk. Confronting the painful memories and misconceptions also provides a change for healing and redemption. I found “Death, Unchartered” to be riveting. The drama also took me back to my early years when I was doing graduate work as a counselor in education. One of my practicums was at an elementary school in a rough area. I will never forget being in the same room with a bunch of fifth graders when their teacher kicked over a desk. Fear of what might happen, when adults weren’t present, made me speak up. His behavior was immediately dismissed as being a result of him being a former cop. Nothing was done. There were other instances like this that came to mind as I read this story. I suspect that there are many others in education with similar stories. 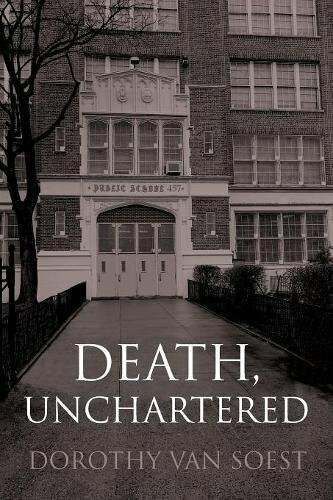 While I think this book is a great choice for readers who enjoy a good murder mystery, I especially recommend “Death, Unchartered” by Dorothy Van Soest to social workers and educators. It will leave an impact.